While the early posts on this topic were discussing the mechanics and workflow of group work, one of the main reasons I wanted to write about this experience, was also to highlight some of the outstanding projects produced by my students. The Recipe Project is one of my favorites because it requires really understanding the medium and genre of the documents involved. That understanding comes in the form of two different requirements of this particular project: 1) breaking down all the elements and concepts of recipe documents, and 2) choosing a different genre and blending them together. Also, groups needed to produce two versions of this document where one focused on an older audience and the other on a younger one. 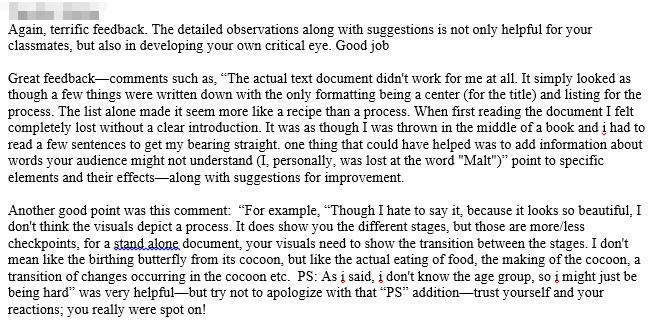 As with all of the projects in the course, my goal is to get my students to see and work beyond conventional concepts of what constitutes a particular type of documents (in this case, a recipe). Here is a copy of the Recipe Project Prompt. Before they began the actual project planning files, they were to first decide as a group who their audience was and which recipe they were going to use as well as which type of document they were going to use as the source for the blended document. They prepared a relaxed “presentation” for the class so that we could ask questions and make sure they were all on the same page. In all, there were two areas with which they had difficulty. The first was with the idea of blending documents itself. For example, the Penguins group decided they wanted to use a recipe for Lenga (beef tongue) since it was the favorite of a group member. However, during that initial class discussion, it was clear that they hadn’t decided on a source type of document; rather, they focused on their audience, but in a general way: for the adults, they would write it more “seriously” and for the younger people, it would be more “fun”. But they were confused when questioned about in what type of format (document) the recipes would show up. To be fair, this was typical during that first discussion. To help, I would ask them about their audience and why they might be wanting to show these people this recipe. That is, I was trying to get them to think about context. One very clever group, the Hedgehogs, decided that they wanted to use a cake ball recipe in the form of the wedding invitation genre. While maintaining the parameters of the writing prompt, they went one step further for the younger audience version by also converting the invitation/recipe into a puzzle. An interesting thing that began to occur later in the semester, was that the groups began to consider their planning forms as part of their finished documents, and began tailoring them to echo the content and style of their finished projects, creating a sort of brand. Here are their Recipe Project Planning Forms they used. If you read through them, you will notice the group’s extreme attention to the details of their different genres. For example, the numbers were spelled out in the adult version because that is part of the invitation’s formality. Although it was a simple thing, they switch to numeric representation for the children’s version because the numbers would be easier to read, yet the tone, while fun, still helped maintain a sense of formality (as did the font usage–which also changed from adult to children audiences). The Recipe Project Report shows how their fellow classmates also responded to such details. With any group work, and in particular with how I’ve set up the assignments and the amount, there are a lot of moving parts for any one project. My approach has been to begin the semester by covering many of the document elements and principles up front, and then applying those concepts to actual projects. I do this to avoid “teaching by mode” because, like freshman composition essays, rarely are documents created using one single type of element or rhetorical tool; that is, successful documents and essays usually make use of many tools and elements. However, the project topics tend to themselves create a more nuanced focus of the material previously discussed. This also helps with “learning” one topic then forgetting about it to move on to the next concept. There is a lot to do in this class and I find that by juggling this many tasks, we cover more assignments and projects than we otherwise might. It’s also necessary if you want to evaluate all parts of any particular project’s processes. And of course you do! The volume of tasks for students also seems to balance out equitably, (my perception of) the lack of difficulty in the material itself, avoiding the “Easy ‘A’ Class” label. Although this organization seems a little…unorganized…,once you dive into it, it begins to make sense. Really, it’s just sheer textual volume that is masked as a seeming lack of organization (students and I both have to pay attention to the schedule!). Admittedly, I do keep an eye open for other tools that I could integrate with Moodle that might help alleviate that sense of overload. 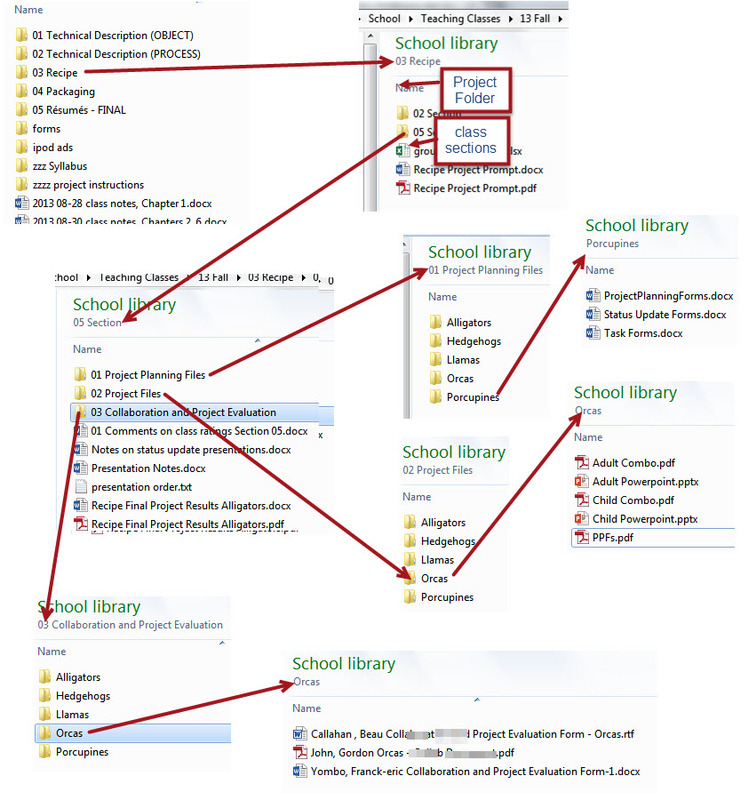 Electronic versions of projects/assignments and the ability to store them without physical copies has been one of the most useful tools for managing my classes. However, even though most projects and assignments do have a digital birth, I also have students turn in hard-copies. A physical manifestation of their work gives them yet another perspective of their work, which is really most assignment’s larger goal. This works for non-digitally created work as well; that is, if it the project was born non-digitally, then students turn in digital photos or scans, again giving them another opportunity to see their work from a different perspective. I was using electronic gradebooks in the form of spreadsheets even before my university set up that feature for our Moodle implementation. And though Moodle’s grading system is mostly a clunky system (and limited), I really do like it—especially for students’ ability to track their grades on their own and grade notifications (online and email). While most professors typically use a total point system of grading, I prefer the weighted percentage method, though the point system really is the same thing–if you know how many quizzes or other assignments you are going to use ahead of time for the entire semester. I never know how many quizzes I’m giving because I use them primarily as a check on whether or not students are doing the reading. Also, the number of projects sometimes changes depending on the speed of the class. 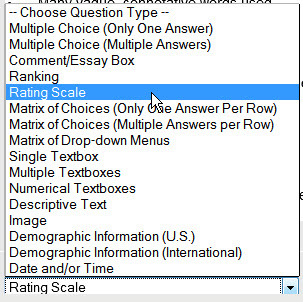 For details on how to set this up weighted grading on Moodle, open up this pdf copy of instructions I created for a particular professor’s American literature class: Sample Weighted Grades Setup. One thing I really like about using Moodle or Blackboard for turning in assignments is the ability to set due dates AND times. I used to set them for 5 minutes after the start of class on the day a project was due, but later changed it to a 5 minutes before–too many groups were busy uploading projects at the last minute from the computer labs, arriving late to class. After the typical rodeo of turning in their first assignments, I’m able to address individual problems so that they become used to the upload process. After that initial run, I maintain a strict no-late-work-accepted policy. That electronic time-keeper removes the burden on me placed by students who are constantly late as well as maintains a sense of fairness to other groups who do get their work in on time. The first time I taught this course, my own comments and grades were the only written feedback about their projects that the students received. I originally thought groups taking notes of their peers’ comments during the workshop would help them be more engaged. But I found this was a missed-opportunity for another chance of engaging with their material and design choices. Also, only a few students consistently volunteered feedback during these workshops. For my 2013 classes, I decided to try a crowdsourced grading approach advocated by Cathy Davidson in her post, “How to Crowdsource Grading” that would hopefully encourage more students to participate in giving more feedback and again, learning from their own observations. For my own brand of crowdsourced grading, I based the project grades on the average of their peers’ evaluations, folding my own rankings into the mix. 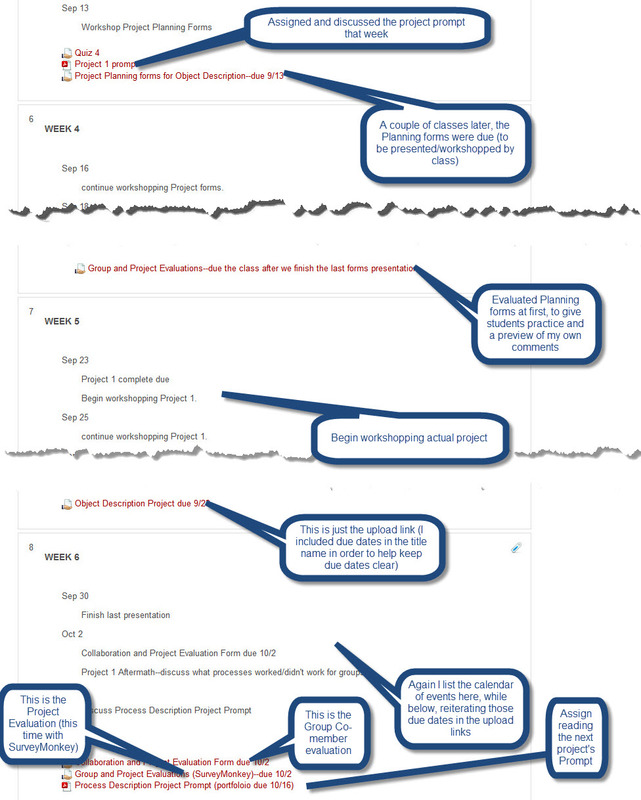 While I typically find rubrics a very limiting way to grade, it quickly became obvious that I needed some sort of descriptive ranking form in order to get everyone on the same page in terms of what and how to evaluate their peers’ projects. It also ended up having the benefit of constantly reminding students of the concepts and question about which we were discussing throughout the semester. I created a 0-5 point scale rubric based on Steven Gerson’s evaluation form found within his Writing That Works A Teacher’s Guide to Technical Writing. 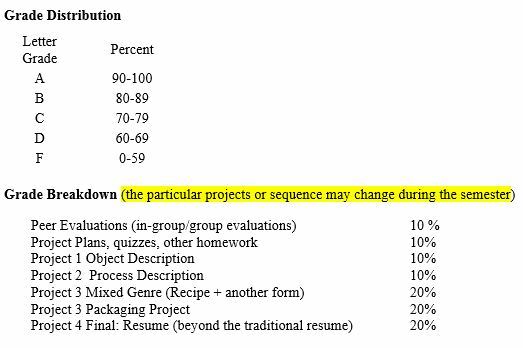 Although my own evaluation scores were averaged along with their peers’ scores, I did reserve the right to adjust a project’s final grade if the class had for some reason missed the complexities of a particular project (which only happened a few times). For the Spring semester, I had thought to use the evaluation forms themselves as a pedagogical exercise and have the students develop their own form using the topic/ratings from my borrowed form. Instead, it was a logistical nightmare. Notice that there are two sets of evaluations for each project: one for individuals grading group projects, and the other, for grading their group co-members’ contributions to those projects. Individual students evaluated each project and presentation. I compiled this information into an Excel spreadsheet. After all the tabulations, I formatted that information into a report within a copy of those worksheets. This meant I would start off with roughly 35 sets of evaluations for each group’s project that ranged from text files html files, in as many different layouts as there were students. For that first semester last year, I had to manually go through each form copying/pasting or retyping in many instances, the different information to my Excel spreadsheets. This also included written comments on what worked well (and why) as well as what worked less well (and why) and how it might be improved. The many different formats I received as well as number of which I could not simply copy and paste the information took entirely too many hours to compile for each project. That Fall semester, I decided this process needed to be automated. One option was to build my own website using a SQL backend. However, while storyboarding my tables and forms, a friend gently reminded me of how much testing and time it would take (class had already begun). So instead he convinced me to look for an out-of-the-box solution. I’ve had some experience implementing SurveyMonkey for a former employer, so I decided to try it out for our projects. It may seem odd at first, but if you think about it, a rubric or evaluation form is really just a survey form. The free version only allow for 10 questions, far fewer than the number of topics I needed, so I upgraded to a paid one. While it wasn’t exactly cheap, it didn’t break my bank account either ($25/month per semester seemed within reason). Unfortunately, the screenshots I made last year disappeared (probably while cleaning up my folder structure—a learning moment for making actual use of my backup system! ), so please be patient with an evaluation using screenshots from an outdated survey as well as from my imperfect memory. The webform for creating the survey had some flexibility but trying to create a ratings system using option buttons lacked the precision I would like it to have and it also took a while build out. Although the individual evaluation areas (using a scale rating) were tedious to build, I was able to easily adapt the topics from that pdf form. Editing the different sections was simple. Adding, deleting, and moving areas worked as you would expect. The form was also browser based, so I didn’t have to worry about computer compatibility. I could also download all the responses to an Excel (or csv) file. The problem was, that a couple of students swore up and down that they submitted responses but nothing showed up on the backend. This was important to confirm because their responses count as part of their grades. But SurveyMonkey does not provide an email confirmation to say if their information was successfully submitted. Students also complained about not being able to edit their responses: I set it up so that there was one generic form for projects within a class for a particular assignment; part of that form required them to fill in their own name, project title, and class number in addition to evaluating the project. This type of setup required then that the student take the same “survey” 5 or 6 times (depending on the number of groups). 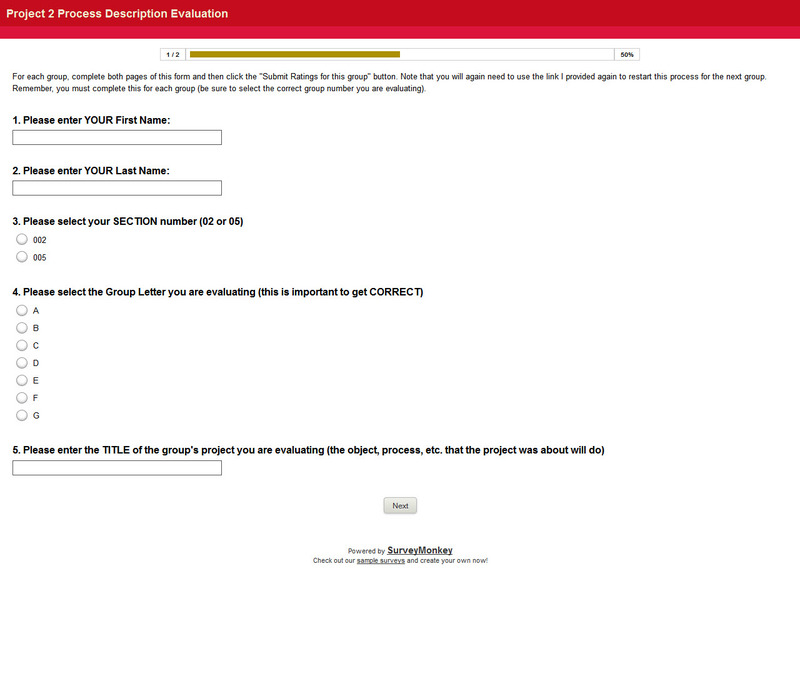 Although this makes sense for a one-off actual survey, it really was tedious and error prone. I could first create a form within Excel and save it as a pdf file. I would then use my own copy of Adobe Acrobat Pro XI to convert the pdf into a form (using form fields in place of the cells I used within Excel). I would then upload this form to FormsCentral where I had further options I could use on this form. For instance, I could insert a submission button within the form itself, so that all the student needed was Adobe Acrobat Reader installed and a web connection to upload the form upon pressing the Submit button. I set it to also email a confirmation back to the student which I customized to also include their own responses to the form (that is, they had a copy of their data as proof of submission in case something went wrong). Distributing the form was also easy. Although I could give students an url, I decided to download and post the newly create form from FormsCentral to the class’ Moodle page. Like SurveyMonkey, I could download the results as an Excel (or csv) file. This was the part for which I really needed automation! I could sort and separate out this information into individual sheets for each group. The one thing I found frustrating was that if I needed to change the form, I couldn’t edit it online because I created it locally. If I had created the form online, I could—but the online creator wasn’t as robust as it was to arrange the form using Excel first). This usually meant going back to Excel and begin the creation process again, though in some instances, it only meant adjusting a form field property (for instance, “required”) and then re-saving that form and re-uploading it to FormsCentral. One potential show-stopper for this product is that it is platform dependent. That is, if the student used a Windows PC with Adobe Acrobat Reader installed, the process worked fine. But that requires that students knows if they are using Acrobat on their computer, which you cannot take for granted. In some cases, they were unknowingly using other PDF software which broke all of the form field features of my Adobe document. But that was a simple problem to solve; just download and install Adobe Acrobat Reader. However, this was a different story for students who used an Apple computer. FormsCentral’s online help about that issue was only so helpful… Most students were able to find a work around which I then distributed to the rest of the class, but sometimes even those solutions inexplicably would not work. For those cases, the students would email me their pdf file and I would manually copy the information over to my spreadsheet. Although I like the features of FormsCentral more than SurveyMonkey, the cross platform compatibility of SurveyMonkey mitigates a large problem, making the idea of a browser solution more appealing than a pdf-bound one. Again, the programmer in me wants to develop my own survey application. I think building one-off webforms (that is, a particular survey page for a particular project) should be fairly easy, but like anything code related, it requires time and testing to ensure you won’t have problems that would get in the way of class time. In the end, it seems that the out-of-the-box solutions are quicker and much easier (involving only a few workarounds) but are still limited (well, from this one sampling–I did look at other solutions such as email-based forms, but those were also lacking). Note: my apologies for the lack of FormsCentral screenshots from the actual site; however, their site does provide good documentation and the interface is fairly intuitive. use just as a quick reference after all grades were turned in. It should be noted that in some of the worksheets, you will occasionally see two types of highlighted rows. They were for accounting purposes. The yellow ones indicate people who never turned in evaluations for that group’s particular project and so would receive no points for that particular evaluation. 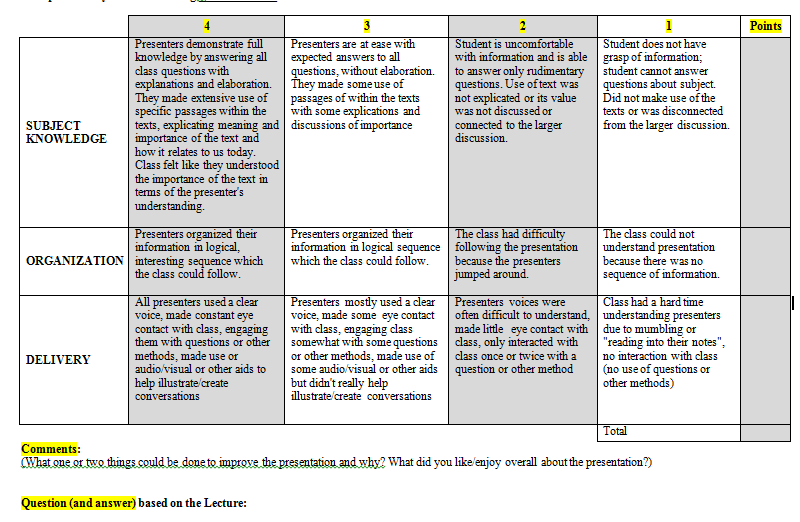 The off-green highlighted rows indicate that the individual in question was a member of the group for which the current worksheet was about–they were presenting their own project, so no evaluations from them were needed. No matter the technology used, the topics themselves as well as ranking scales are ultimately what’s important in terms of student evaluations. I was embarrassed by my earlier attempts and so engaged the students themselves to evaluate their evaluation forms. Again, pedagogically, I thought it would be a useful exercise. In practice, most student feedback was not very considered. However, they did point out a few inconsistencies. In the end, the 0ne thing I was trying to avoid was creating specific evaluation forms for specific projects–that is, I wanted to use one form for all projects. I really wanted the lower maintenance of a generic form, but after scouring the web for examples of such forms, what I did find was just as problematic as my own. Not only are grade descriptions too generic there just weren’t that many samples available, which is why I made it a point to include my own in this posting–not that I think they are perfect (far from it) but they might help serve someone else as a starting point. Typically, most students began workshop comments as well as written comments at a very generic level and with little support. On that first round, I didn’t count off; they received full points. After all, they were learning about details and I was trying to be positive. On the next project, I would remind them of comments and suggestions I made on their first set of evaluations and take off a few points. I would do this until later, they would receive very little points. But even with my streamed down style, providing this kind of feedback is important. I would even say it was one of more important learning moments for students. 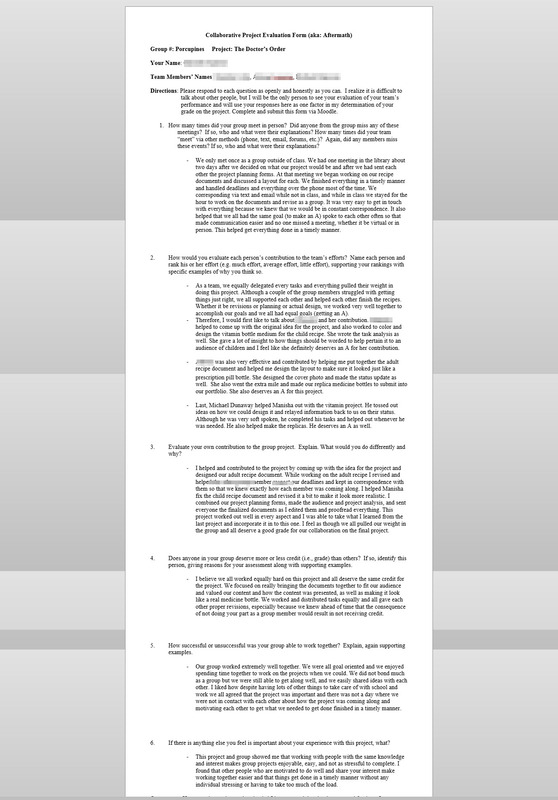 If you read through the sample Report pdf above, you’ll get a better idea for the range of comments. I freely admit that this is an area I need to spend more time experimenting with but even so, I would never cut this part out of the class. Group work is difficult no matter the technology or students. On the first day of class, I spend the bulk of the time explaining how and why the class will operate collaboratively for the entire semester. Each semester, there is usually one or two students who decide to drop the class because of this. I freely admit to my classes that in high school, or as an undergraduate in college, I did not enjoy working in groups–mainly, because there was always at least one person who would not participate for one reason or another, thereby making the rest of the group do all the work. Or worse still, I sometimes ended up doing the entire assignment myself with everyone else receiving equal credit. There always seems to be students who, no matter what, won’t participate. And that is a problem with group work. It may not be obvious, but assigning groups is not as simple as it sounds. The first few times that I assigned group projects, I let the students decide among themselves in which groups they wanted to be, believing that by being democratic, the students would feel empowered and therefore would be more engaged. I was wrong. Although there were some people who did gain a measure of inspiration by being self-directed, most students’ selection was based on friendships, race, popularity, attractiveness, or just whoever hadn’t yet found a place within a group. This would result in some bonding but more often created a sense of exclusion among members–before projects even started. To avoid this, I started assigning people to groups myself. At first, I tried the counting off or drawing names methods, but to do this strictly by hand was time-consuming, and really not as random as I would like (for example, seat placement and attendance issues would bias the randomness). 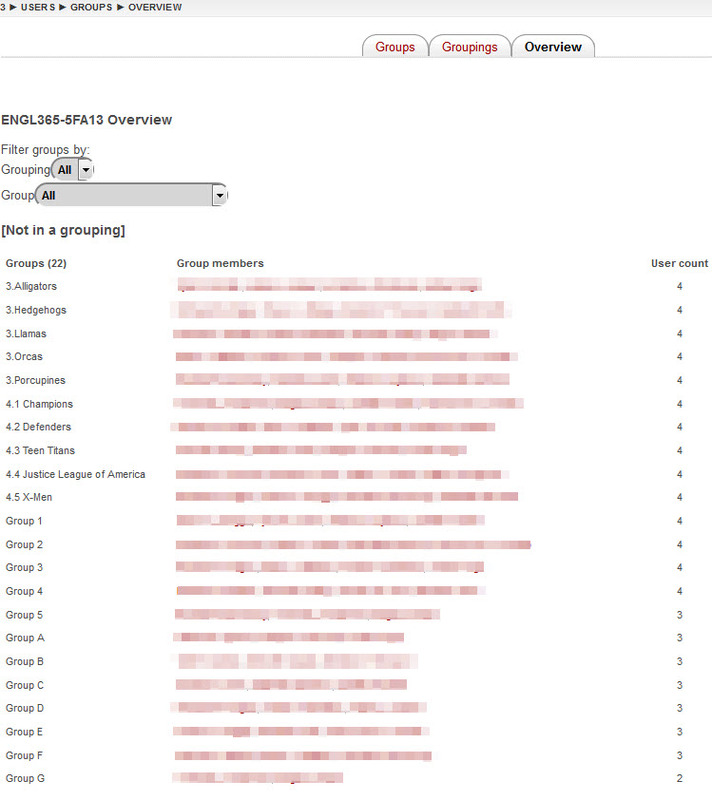 So instead, I used Moodle’s Random function within group creation (you can create groups based on on the total number of groups desired or on the number of members desired per group). Since I was often still grading projects after assigning new projects, this meant that within Moodle, people were assigned to multiple groups which also meant I had to use different naming conventions to keep from confusing myself as well as my students. But Moodle’s automated group creation only allows for numeric or alphabetic naming conventions (“Group 01” or “Group A”)–which made it difficult to keep track of when we got beyond the first two projects. I could have recycled those groups by deleting them and then recreating them but I like having the history. 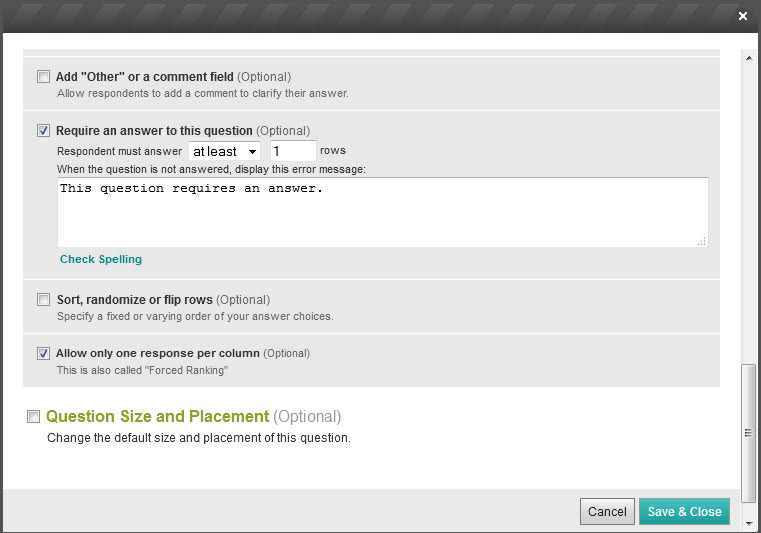 The problem with Groups within Moodle is that it creates them at the class level rather than at the assignment level. 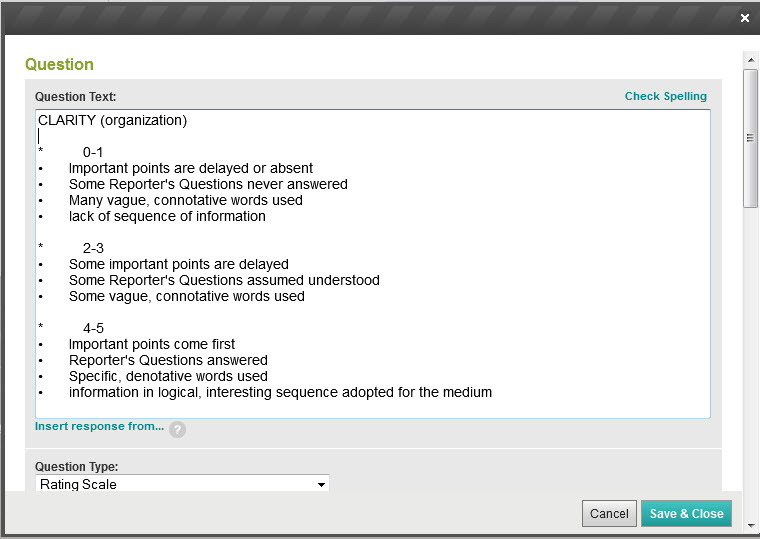 It would be handy, if on the assignment creation page, there were an option to create groups on that level. This would alleviate the need to use different naming conventions; that is, I could just stick with “Group 01”, etc. But the different conventions proved an adequate workaround. So instead of recycling (deleting and recreating) the group names, I began using Moodle’s random group creation as a starting point only, so as to get a rough draft assignment for everyone. I would then copy and paste those groups and members into a spreadsheet and then manually adjust the assignments. I then went back to Moodle to manually create the groups using such group naming conventions as animal names or comic book titles (Alpacas, The Defenders, etc. ), making the assignments based on my spreadsheet. It took time to ensure that group members hadn’t previously worked together (though this was almost impossible by the last couple of projects). This mixed solution had the added benefit of helping me sometimes find “better” fits for some group members whom I thought would benefit more by working with other students in particular. Overall, I thought working with new people mimicked how real world jobs work. We typically don’t get to choose who our team members are and so learning how to navigate such group politics and issues while working towards a common goal is invaluable. Also, it continually helped teach the valuing of assessing people’s skills and knowledge at the outset and applying that information to the project at hand. And perhaps more importantly in terms of college, it helped connect people who otherwise may have never had the opportunity of meeting one another. One of the most rewarding things about such a class is receiving an email from a former student who happens to mention still being in contact with former group-mates. So what makes a good group size? I’ve tried from 2 to 6 members early on. 2 member groups are too small–if one person was sick or decided to drop the course or just plain wasn’t working, that meant that the other person had to bear the responsibility for the entire project alone. 5 and 6 member groups are too large–mainly from a logistic perspective; that is, although I made some class time available for the groups to work on their projects, the majority of the work was done outside the classroom; accomodating that many different class and work schedules can be very difficult. I found that 3-4 people sized groups is the sweet spot (though depending on the project, even 4 can be a little too much to divide the responsibilities). This allowed groups to recover from for the absence of a member, added the brainstorming power of divergent perspectives, and perhaps more importantly, an provided the opportunity for an equitable division of labor. As I mentioned, most group work was done outside of the classroom. To get groups to thinking about potential challenges, we discussed the pros and cons of face-to-face meetings as well as synchronous and asynchronous technological tools (email, texting, video conferencing, phone calls, etc). Some groups always met face-to-face (like at the library), and some groups tried using only email. The most seemingly productive groups tended to use a combination of face-to-face meetings and distance communication tools. These groups typically began with a face-t0-face meeting, brainstorming on a project goal and developing a temporary plan and schedule. They would use this plan to set up dates/times and methods of communication. I also I created Moodle forums for each group that were only visible to their members. However, almost no groups ever used them (and even then, only initially), though this did vary from semester to semester. For assignments, I required that in addition to one hard-copy being turned in, each group member uploaded digital files to Moodle. They had to turn in the same copy; I had each member turn in a separate copy for accounting reasons. Although Moodle lets you filter the class by groups on its grading page, I want to be sure I was working with the correct people–and, it also was another way to encourage member participation by making their accountability very visible (if they were not doing the work, it would be highly unlikely that the other members would share their files). About those “Digital files”: since Microsoft Office was freely available on campus computers in the library and various labs, and since I also have my own copy of that produce, I stipulated that the file formats had to be in one of the Office file formats (such as .docx) or .rtf (rich text format). But I did not want to limit students to a particular software package, so I also allowed for any program that could save or print to a .pdf file. And in the case where some projects were more of a physical nature (the Packaging project, for example), they could take digital pictures and upload those to Moodle. Typically, most projects were created digitally, but I also felt it was helpful to see hard copy manifestations of it (again, such as the Packaging Project). This also meant that I did not teach any particular program, although I would demonstrate useful tips and tricks within Word or other tools. I posted links to different applications as I came across them on the web (such as Prezi.com). I also encouraged students to share their discoveries with the class as well. One such application that a group used one semester was pixlr.com–a Photoshop-like web application. Although I did not teach any particular application, students were free to ask me for help and we would learn together. I enjoyed those moments because it demonstrated that you don’t have to be a “guru” to learn a new tool–just a willingness to play. One issue where technology was a problem for the groups was with operating system/software compatibility. Usually, this was in the form of some members using Apple laptops while others used Windows. Most of the time, they could save to one another’s format (i.e. Office for Mac) but even then, there were minor changes in formatting that would occur. This was a problem usually for the presentation part of the project (I had a projector but no Mac adapter)–and those formatting issues could really hurt evaluations (so we had to be sure to acknowledge those issues during the presentations). In the next post, I’ll discuss the evaluation (grading) and mechanics of the projects: Pt 3. I’ve slowly been expanding collaborative learning within my courses, from testing out group essays within Freshman Composition classes, to group projects within Early American Literature classes which included projects (and presentations) on specific short stories as well as creating a video essay on larger topics such as, what is American Literature. In addition to my own earlier attempts, my interest in group projects was further fueled after having read discussions on collaborative learning and general education reform within the HASTAC community forums. While I was at first skeptical of contract grading, the concept was intriguing and seemed like it could possibly fit in with my previous class group work. So I decided to give the idea the proverbial “old college try” and last year, conducted a larger classroom experiment by building the entire semester around collaboration–not just for students, but for myself as well. Being able to integrate your teaching style/philosophy into whichever pedagogical camp subscribe to is of primary importance. My own style requires less straight lecturing and more student interaction. You might call it a cousin to the throw-students-into-the lake-and-let-them-swim approach. That is, I feel students learn best by struggling with the material themselves more than by lecturing alone. Of course, I do lecture, but generally by way of asking questions and playing devil’s advocate in order to get a discussion going regarding the day’s particular topic, slowly getting students to develop themselves the connections between the material. It seems to me that no matter the subject, the courses are really about critical thinking skills, that is, slowing down all the information or processes we take for granted, and holding them up to a magnifying glass. And while I cannot physically pull and poke students’ thoughts, I am able to ask questions during these struggles that help students discover a direction in which to take them. In terms of collaborative learning (well, any learning) the trick always seems to rest with the How of incorporating these questions into assignments and projects that can also be evaluated in a way that is useful to the student (beyond a numbered ranking) as well as to my own skills. There is much more to collaborative work within a particular class than just having students work in groups. This posting is about sharing last year’s experiences within my Technical Writing courses in regard to the class structure itself as well as the group work. The first time I taught a Technical Writing class was back in 2009 and began somewhat awkwardly. I had at first tried following chapter by chapter the assigned textbook, which was more centered on business writing than that of the larger field of technical writing—that is, they were more focused on particular formats and elements in sort of a recipe approach rather than larger discussions on why or how the ingredients worked alone and with others, which only encouraged students to throw in such ingredients without much consideration for why they used them (“It looked nice” was the typical justification). I also made the mistake of trying to teach HTML in order for students to create their own websites. We spent a week at the beginning of the semester going over basics, and then they were to turn in a first version of their websites for their midterms, then revise them for the Final, incorporating principles they learned during the semester. In the end, many students “cheated” by using pre-made templates which removed all of the design decisions they were supposed to be focusing on for that project. While I believe learning HTML basics is valuable for other courses, there are so many tools and platforms available for document design projects, such as WordPress, that learning HTML only gets in the way for this particular course. If this were a Digital Writing course, for example, starting off with coding their own websites would be invaluable before moving into other platforms in that students would learn what those other platforms would be “helping” them with as well as gaining insight on how they might customize such tools. One thing that worked really well was the workshop format of the class in that it fostered critical thinking skills from both the individual as well as the group aspects. Groups organized a very short presentation of their projects (three minutes) focused not so much on the content goal of a particular subject, but rather, on the details of the project itself, such as why the student chose one font over another. Or the size of it. Or color. Or placement. The presentations were to focus on the choices the groups made with their particular audience in mind as well as the goal of the document. After the presentations, the class would then workshop the project, while the particular creators took notes, remained silent until after we were finished with the discussion (here, my poetry workshop roots show). At the beginning of the semester, I usually would start the discussions in order to demonstrate the sorts of details and issues I was trying to get them to focus on—as well as to steer them away from comments like, “Oh, I like the colors she used” and instead concentrate their comments on why the element in question was effective or not (again, in terms of the project’s stated audience and goal of its document). After only a few classes, the classes began leading the discussions. Given their own resistance to things new, I also decided to help them be creative for the Final. Instead of a written exam or essay, they are going to make a 10-15 minute video, interviewing people. That is, they are treating this as an experiment based on a question they have developed from our readings. 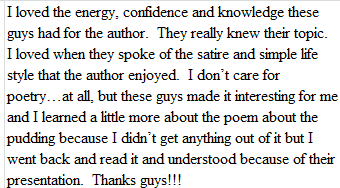 I gave them a base question that I myself am interested in: what makes American literature American? But they could also develop their own. For instance, one group is thinking about exploring the idea that, given we believe our country was founded on religious freedom (they could pull ideas from Winthrop, the Declaration, etc…), are we really free to believe as much as we think we are? I think given the nature of the current Republican debates, it’s a great question. Some have already prepared a proposal and met with me to make sure they were clear on what the project was about as well as help them narrow down their question and possible methods for exploring it. They are actually becoming excited (whereas at first, they let out a collective groan…). On the day of the Final, each group introduced their video, trying to summarize it in the way that might appear on the back of the dvd case. The mood was palpably one of excitement–much like graduation. Not only did they surprise me with their different creative approaches, they surprised themselves even more so. It was one of my most favorite class moments ever. I liked the results so much, that for my Technical Writing course this semester, I’m focusing the entire semester on collaborative work presented in a workshop style setting. We’re concentrating on the creative process and design choices. But I’ll (hopefully!) write more on their work later. Over the last few years or so, whether I was teaching a composition class or some other course like tech writing, I usually incorporated a group project that involved a group writing assignment (for example an essay or brochure). Students usually resisted this–heck, I would have not liked it back in my undergraduate days. And even now, I find it hard to let myself rely on others to do their work or at least up to some sort of standard that comes to me while looking at their work… But having worked in the world outside of academia, the corporate world, I found that many minds help to not only solve problems but also help to develop creative approaches to begin with–approaches I may have been resistant to, had I even been lucky enough to think of them myself. Of course, this doesn’t always work. Personality, personal agendas can get in the way. However, good or bad, all of these group projects, at the very least, always had the one benefit of making us actually start a project. And there is much to be said for starting. In writing terms, that means dirtying that awful blank page staring back at us. I’ve found that in college, especially the 101 and 102 composition courses, such group writing had the effect of showing less than good writers examples of better writing and how it worked down to a sentence level–at least if they happened to be paired with a better writer. And if they weren’t, the group dynamic still helped because they were able to challenge one another, speaking out when the sentences or ideas didn’t make sense–they may have not known how to fix them, but it gave them enough of a feeling of solidarity as well as confidence of having honestly tried, to come ask for my advice–which is another difficult thing to get students to do at the beginning of the semester. I had planned on doing the same thing this semester for my Early American Literature class. However, the weekend before classes started, I happened to read Cathy Davidson’s Now You See It: How the Brain Science of Attention Will Transform the Way We Live, Work, and Learn. I thought her Revolution and the Word: The Rise of the Novel in America was an excellent piece of scholarship. Now You See It was more of an evangelical piece, particularly promoting education reform, for which it does a terrific job, and I recommend it, especially for teachers. Basically, it inspired me to try more collaborative work for this class, even for setting up the class itself, where the students decide what to do for class projects as well as the midterm exam and Final. I thought about implementing the crowdsourced and contract grading system Davidson discusses on the HASTAC blogs. At first I was really resistant to this idea because I couldn’t see how quality control fit in. But finally, I realized that the crowd sourced part was the quality control part of it, using the contracts as the measuring stick (however, I’ve still to come up with a good response to a fellow teacher’s response to the contract part : “Well, isn’t that really how the normal grading (a,b,c, f) along with a description of that grading system works?”). The trick is, I think, to make sure all work is open to all students. And so at first, I had planned on using Moodle forums to make it easier for that visibility to occur (hoping that would also motivate students to turn in better work than they might otherwise do). In this spirit of collaborative learning/teaching, I got my students’ opinion about this setup. Almost without fail, students said that they wanted a way to make this anonymous. And they had cited good reasons: negative feedback from fellow group members, as well as other people in the class, might could create a hostile environment. I explained to them that that was part of the course goals—learning how to give and receive feedback in ways that helps everyone—skills also needed in the business world (dept meetings, team projects, etc.). But the push-back was unanimous. And so, I switch to individual uploadings of these assignments to Moodle so that I could gather/collated evaluations then distribute a compilation in order to keep them private. Because of this, I decided to drop the crowd sourced/contract grading. I still am interested in the idea, and will try it out next semester, hopefully—it’s just that I needed more planning than the weekend before classes! Originally, the assignment schedule looked like this: I had a set of readings assigned for each class. Instead of giving reading quizzes, the students would be responsible for uploading to Moodle, one question (and its answer) about the author (sometimes two authors) we were discussing that day. For each class day, two groups would present a particular author/text we were covering (based on our reading schedule). Although I would have preferred to have only one presentation per class where I could spend more time with setting up contexts, there are 38 students in the class, necessitating that two group per class presented (so as to have a grade beside homework grade before the midterm). The rest of the class was also responsible for filling out an evaluation form for each presentation, consisting of ranking from 1-4 the areas of Subject Knowledge, Organization, and Delivery. Additionally, they were required to give comments on specific things that they found helpful to understanding the text/author as well as suggestions on how the group might have improved the presentation. And to help the students with paying attention, they were also to include one question with its answer based on the material from the presentation. They were to upload these evaluations to Moodle by the start of the next class. The members of the group presentations obviously did not need to fill out the form. However, they were given a week to upload to Moodle a 3-5 page evaluation essay of their experience of the project, discussing what their goal was, how each of the other people’s contributions helped or hurt the presentation, as well as their own contributions, and what they learned or might have done differently. All of this was happening every class. Although this seems like a lot of things for each student to be responsible for each class, I thought they were fairly small in scope and manageable. I was looking for ways to engage them in the texts as well as discussions of the texts beyond the typical reading quiz. However, I forgot that I had to provide comments for everything. The grading was based on completion rather than quality, but even so, commenting on their comments, etc took much time that would have been better spent elsewhere. I quickly decided that we were going to do things differently once we were through the midterm, though I am willing to keep on due to the improvement. 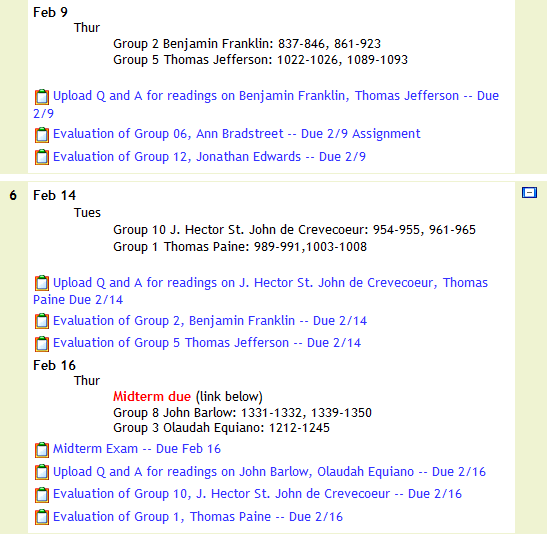 My Moodle setup has been somewhat of a nightmare—in terms of my keeping track of everything. So no matter what, this part is going to change. The Midterm assignment was a 3-5 page compare and contrast essay of two authors/texts we had discussed so far (anything from writing/rhetorical styles, to evolution of belief systems—or anything else). As I mentioned, the class was involved with coming up with their assignments. However, for the midterm, they showed no imagination–everyone want a traditional test of sorts. This was disappointing (I really don’t believe literature ought to be about memorization of facts). So I decided to give them an example of what to expect on such a test. They changed their minds, but still refused to suggest anything in place of it. So that’s how we ended up with an essay. Looking back, it wasn’t a bad idea. But still, I’m surprised at the resistance to move from one form of education to a new one. How has all this worked so far? Notice the grade at the bottom. This was my version of crowdsource grading. 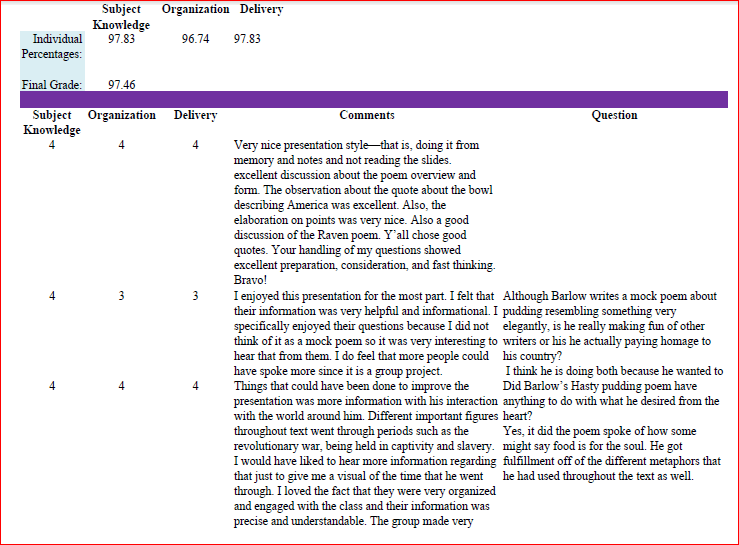 It included not only my own evaluation but the rest of the class’s as well. I noticed that students consistently either wanted to not ever say anything negative (“I wouldn’t change a thing” along with “Great job!” variety), or they tended to be very critical of the performance part of the presentation. Much more so than myself. 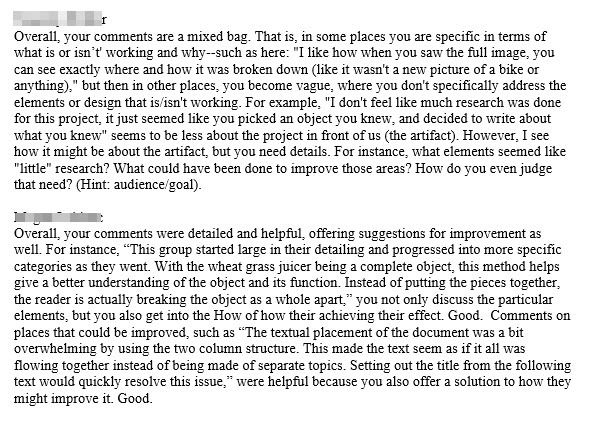 Again, with lots of commenting on their evaluations from me, these evaluations started to focus more on the content and what helped the student understand the author or text better–and what didn’t. Again, I was surprised though, that given they could do anything–and I mean anything (i.e. put Thomas Paine on trial over his Age of Reason), everyone one did the exact same thing: a PowerPoint presentation, beginning with a bio, and then using quotes, along with some questions for the class. And that’s a perfectly reasonable way to do it. However, I was hoping that being not only allowed but cheered on to do anything out of the box, it would have inspired more people to try different things. My guess is that everyone settled on the idea of what constituted a “presentation” based on what the first group did. But that aside, some things that I noticed about the presentations, was that most groups in the beginning, focused on biography–usually lifted directly from the Heath introductions, as well as, giving a plot summary–rather than digging into the text itself. But I honestly expected this. What works well about these presentation formats, though, is that it allows me to lecture during their presentation based on what points they bring up, providing context and explanations of issues that the groups might not have brought up, or elaborating on the importance of points they did bring to the class’ attention. I noticed that this sort of movement, these shiftings of attention, help keep the class engaged (as opposed to my lecturing the whole period while they try to stay awake–it’s an 8am class). And for the group members, it gives them the opportunity to learn a lot more about (at least one of) the works. When it came to the groups evaluation essays (of their presentation experience) as well as the Midterm compare/contrast essays, they were a disaster. It was as if they had forgotten everything from their 101 and 102 classes about what makes an essay an essay, or even how paragraph works. They also tended to be very general–so much so, that often it was unclear that the evaluation’s topic had anything to do with a presentation of an early American writer. Having said this, though, there were a couple of outstanding essays. But for the rest, instead of marking them with poor grades, I decided to let them revise them. Although I provided a lot of feedback, both on essay mechanics as well as content, I also advised them to work with our Writing Center before resubmitting them. It’s not that I’m an overly-kind teacher (I normally wouldn’t want to regrade two sets of 38 essays), but I don’t believe poor writing ought to prevent passing a class on literature–it’s not the goal of this particular course (which is to see how the different belief systems have evolved and still are present within our culture), though it’s one of the few tools by which I can evaluate whether or not they’ve reach that goal. It was also a chance to remind students that the structure and mechanics they learned in 101 and 102 aren’t just there to torment them, but to help make their ideas clear. I’ve only started to grade their revisions, but so far, they look much, much stronger. In retrospect, I think what happened was that they believed since this was not a writing course, they didn’t need to worry about their writing. Along with their revisions, I received many notes thanking me for the opportunity to make those revisions. Gratitude goes a long way. The original plan for the semester was to two group presentations (before and after the midterm). And I’m still all for them doing that, however, I wanted to be able to slow down after such a flurry of activity during the first part of the semester. I opened up the question of what our next project should be to the class asking them to submit ideas. Only one person responded–doing some sort of skit (which could be fun and informative). I could just say “Okay, since only one person responded, we’ll just do the same thing as the first presentation.” Instead, however, I’m trying to get them to explore different methods, to be inventive, imaginative. And though I’m greatly nervous as to what people will come up with, I’ve decided to put the creative ball back in their court, and ask them to each submit a proposal for a group project. The reason why I am nervous is that I’m guessing many will want to do the same thing as they did for the first one. But, honestly, this is still okay. What it also does, though, is to open the doors for some people to try, if they want, something different. For now, a final thought on collaborative learning/teaching: it takes planning and time. However, even though I decided on this setup at the last second, there is something to also be said for the forced organic nature of it. I’m tickled with how this class is shaping up and how the students’ critical eyes are developing. But this kind of approach is more than just about teachers being willing to try something new; it’s also about overcoming students’ own resistance to new ways of teaching/learning–which is something I haven’t heard discussed before. It seems that, generally, it’s assumed students are demanding new ways of instruction–and that may be the case; but for me, it seems that that’s only the case when it doesn’t involve any changes on the students’ part. If so, there is a lot of resistance. In this sense, the collaboration seems to need to to occur even in the decision to collaborate.